This is album number two from the New York City based singer, songwriter, pianist, and follows on from the impressive debut ‘Tennessee and other stories.’ It is a big leap forward in fire, sheer raw passion and in many ways musicality. The only real downside is that it’s often difficult to pick up the vocals, something that many, me included at times, will turn into a plus on this album that creates a unique dense atmosphe, rather than being all about the lyrics. Where it is a shame is in the fact that Hans Chew is a talented lyricist as well as singer songwriter pianist, although it is relatively easy to find those lyrics on line. My impression after one listen to the album was that it would be quite something to hear this performed with the band in a live setting. When I saw him live, minus the band, a few years ago he put on a memorable performance but it is obvious his scope, musical ambition and talent have developed even further since that time. The tempos soar and plunge with the songs often having a feeling of freeform experimentalism that can only be attained by a writer and band who are finely attuned to the songs requirements and just how far they can go without doing any damage. Fortunately they just about keep within those boundaries, taking everything to it’s absolute limit of feelings, fire, passion and tremendous musical skill on a recording that often becomes a ‘noise fest’ on some songs but one that is always under control. 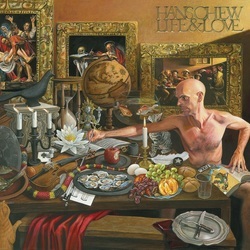 Whilst I have already mentioned that Hans vocal often seems overwhelmed in the mix, there are some very good songs and performances by a relatively new artists who continues to plough his own unique musical furrow with a distinctly recognizable sound. He is the possessor of an incredibly expressive vocal style that has the ability to build to a real ferocity and to come back down again to show a little tenderness. Despite very few generic similarities he shows the same fire, passion and commitment as bands such as Dr feelgood showed way back in the 1970s, similarly the Rolling Sones or The Faces, although the sound of the two latter bands does, on occasions, stylistically overlap with Hans. Despite the attack the, albeit raw, melodicism is never far away. It is not just a question of crashing, overwhelming music, but is well thought out and arranged in such a way that the difficulty in grasping some of the lyrics just adds to the albums power. The recording veers from bluesiness to classic rock, even including some fiery R & B, and all points in between, driven by his rolling boogie woogie piano. There is tremendous support from Dave Cavallo on guitar, Ricardo Ortiz on bass and vocals, with Jesse Wallace playing drums and vocals, all of whom are masters of their art and, like Hans, play with a controlled fire and passion on this album. Album opener Chango gets under way slowly with nice chiming guitars before being joined by Hans vocal and some excellent harmonies, then the rest of the band kicks in on a song that gradually takes off with slashing slide guitar and drums, eventually building into a ferocious intensity and finishing with his chiming piano. Tom Hughes Town gets off the mark with a heavy guitar and drum mix before Hans vocal and piano slow things down, eventually joined by a twangy guitar on an excellent mid tempo rootsy rocker. Goodnight is a slow moody ballad driven by Hans atmospheric vocal and piano with a nice guitar sound as backup and some excellent harmonies, followed by Mercy, a song that is at times a little reminiscent of Rod Stewart and the Faces but more by attitude than anything else. It is a really hard driving explosive song that has a strong melody and variations, with a tremendous amount going on in the course of the song that takes it very close to going over the top but to Hans and the bands credit it falls short and ends up working brilliantly. All of those styles and comparisons mentioned above are merely superfluous side issues, used only to give a vague impression of what to expect when you press play on your copy of the album. It is easy to hear why this man has recently been hailed as someone a little bit special in the field of roots music because he is a completely unique and original singer songwriter who attacks every song with incredible raw power and passion. Buy both his albums, but above all, see him live. You will be in for a treat!